Each year’s program focuses on a timely topic, designed to bring together professionals involved in the different components of large-scale urban restoration and green infrastructure projects, including landscape architects, garden designers, landscape contractors, restoration companies and organizations, project managers and landscape maintenance staff from institutions and agencies. Christina Pfeiffer, Horticulture Consultant & Educator and a Consulting Associate at Urban Forestry Services, Inc.
Glyphosate outperforms watering for increasing the growth and survival of black cottonwood stakes in pasture grasses on the Cedar River, WA. King County Monitoring Memo. Feb. 14, 2017. 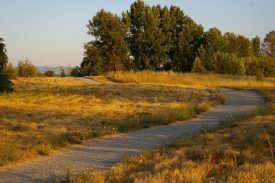 What do we mean by urban natural areas? Primarily, landscapes planted with native species in parks and public lands, wetland buffers, and the boundary areas between the built environment and natural forests. What is the format of this seminar? Participants will be seated in groups, arranged by interdisciplinary roles/job titles. One facilitator or presenter will be at each table. Unstructured networking time is offered at lunch and breaks. Structured networking time will be facilitated through round table discussion questions. Day 1, Jan. 30: Presentations will focus on early-stage processes (Planning/Design/Plant Selection/Installation Standards/Budgets/Admin). Day 2, Jan. 31: Presentations will focus on fostering long-term stewardship (Monitoring/Maintenance/Adaptive Management). Registration will include one- and two-day attendance options. Thank you to our planning committee, the speakers, and all who attended! Seminar description: Building on the strong response to the first seminar of this type held last year, this two-day seminar brings together professionals involved in all phases of urban restoration projects to discuss some of the unique challenges and the strategies for planning, designing, constructing and maintaining restoration projects within high density urban areas. Restoring natural areas in urban locations is made uniquely challenging by the simple proximity of people to those restoration efforts. This year we are focusing on the challenges of undertaking restoration given the pressures of urbanization, including both human health benefits and safety concerns, tensions between restoration and visitor usage, project sustainability and managing wildlife. Participants and presenters will work together to identify ways to bridge theory and practice as we work toward restoration projects that successfully meet our communities’ ecological, social, and economic goals. Christina Pfeiffer, Horticulture Educator | Consulting Associate, Urban Forestry Services, Inc.
Wolf, K.L. 2017. Nature for Human Health and Wellness. Washington Park Arboretum Bulletin 78,4: 18-22. House, E., C. O’Connor, K. Wolf, J. Israel, & T. Reynolds. 2016. Outside our Doors: the benefits of cities where people and nature thrive. Seattle, WA: The Nature Conservancy, Washington State Chapter, 26 pp. Peggy Gaynor, FASLA, Principal, GAYNOR, Inc.
What’s behind today’s restoration projects? Christina Pfeiffer, horticulture consultant, educator, and consulting associate with Urban Forestry Services, Inc.